Tigers spoil the home opener for Alabama State. 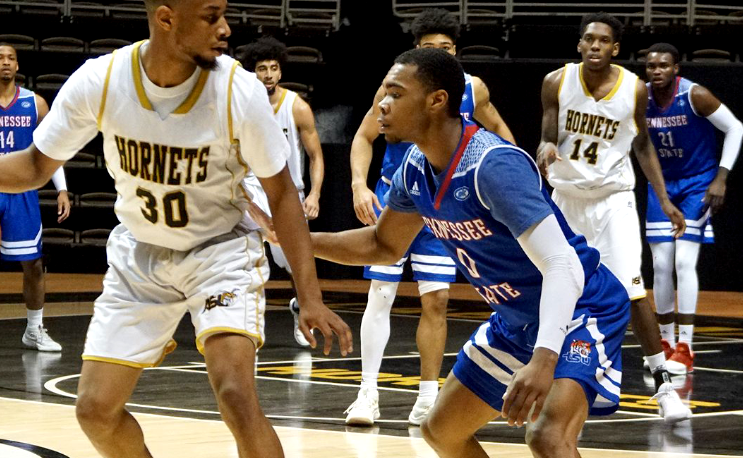 Alabama State (0-9) opened up the home portion of its regular season schedule Tuesday night with a 64-45 loss to border rival Tennessee State. Seven minutes into the game it was all Hornets as they jumped out to a 12-6 lead but then the Tigers showed their teeth. TSU (5-3) held a slight 33-29 halftime edge but put the brakes on defensively from that point forward. ASU only scored 16 points in the second half, shooting 21 percent from the floor for the game. It’s the second time this season TSU has held an opponent to a 20 point half. Christian Mekowulu picked up his third-consecutive double-double with 14 points and 10 rebounds. Kamar McKnight scored 14 points in his first career start, while Ken’Darrius Hamilton, who is from Montgomery, scored 10 points. Reginald Gee led Alabama State (0-9) with nine points, while Rodney Simeon finished with eight in his first game back this season. Simeon also added seven rebounds, while Branden Johnson finished with seven points and four rebounds. Tennessee State visits North Carolina A&T on Friday night in Greensboro, N.C. while Alabama State hosts Winthrop on Saturday at home.